Basabe, 18, has brought a combination of power and speed in his first year with the Spinners' after a solid 2014 campaign split between the DSL and GCL Red Sox. Basabe leads the team in slugging percentage among players with more than 30 games under their belt this season, and has supplemented that pop with a .357 OBP and a team-best 13 stolen bases. 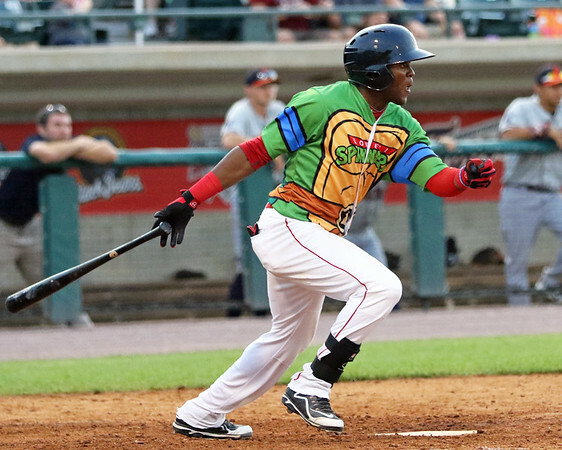 Basabe, a switch-hitter, became the first Spinner in franchise history to smack home runs from both sides of the plate in the same game, and has hit six home runs on the season (four from the left side, two from the right). Basabe rounds out the top 30 prospects on SoxProspects.com. De La Guerra was selected in the 17th round of this year's draft, and has hit .271 with a .723 OPS in his first professional season. A 22-year-old from Grand Canyon University, De La Guerra has been a solid addition to the Spinners' lineup, driving in 18 runs and racking up nine doubles in 34 games. Ranking as SoxProspects.com's 43rd-best prospect, Acosta is hitting a team-best .286 with a .721 OPS in 36 games, split between third base and left field. The 19-year-old, signed as an international free agent in 2013, has been very hot as of late, going 11 for 30 over his last seven games. Acosta has hit .356/.383/.467 against lefties in 47 plate appearances this season. Garcia, the lone pitching representative for Lowell, has posted a 1.25 ERA in 13 appearances and 21 2/3 innings, going 3-1 and recording five saves. The tall righty, who has been a member of the Red Sox organization since 2011, has been very tough against both righties and lefties, limiting same-handed hitters to a .255 average and lefties to a .172 average. He's fanned 25 and walked 13. The All-Star Game will take place on Tuesday, August 18 at Ripken Stadium in Aberdeen, MD, home of the IronBirds.